Over the last few months, The San Pedro Sun has reported on the repairs the San Pedro PolyClinic II has been in need of, namely the major repairs needed to its roof in order to maintain operations. The repairs needed were to be completed at an estimated cost of $40,000.00 BZ, which would include the cost of materials - importation costs as well as stamp duties, labor and overseeing fee and a buffer for unexpected costs; and would provide a permanent solution to the Clinic's roof problems. With the Ministry of Health initially committing to only $8,000 towards the project, the business community and residents of Ambergris Caye went full force at work to raise the additional funds of $32,000.00. 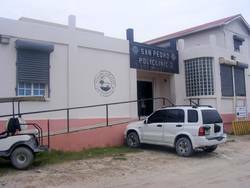 While the San Pedro Business Association (SPBA) commenced its efforts to raise the funds, Ms. Melinda Guerra, Action Regional Manager for the Central Health Region of the Ministry of Health went ahead and submitted a request to the Government of Belize for the total amount needed for the repairs. With local entrepreneurs Mukul and Kelly Kanabar of Blue Water Grill, Caliente and Red Ginger restaurants generously offering to assist in the fund raising efforts by matching every dollar pledged by groups and individuals, raising the funds was not a difficult task. The goal was met on Tuesday October 26th at about 5:00pm when a final donation of $5000BZ was made by an anonymous donor and matched by the Kanabars. In the meantime, while awaiting the commencement of the repair work on the roof of the PolyClinic, the SPBA learned that the Government of Belize had approved the funding for the repairs in mid-December. In an interview with Mrs. Syme of the SPBA, she stated, "in mid-December the PolyClinic's request to the GOB was approved. The Ministry moved quickly to secure a building contractor and a contract was signed. At that time the SPBA informed the donors of the new development. The majority of the donated funds were returned to the donors as the funds had been collected for a specific purpose which was no longer necessary. A small portion of the donated funds are still pledged to assist in other PolyClinic projects." Mr. Vellos, Administrator for the San Pedro Poly Clinic informed The Sun that work has commenced on the clinic as of last week, however the duration of the project is not yet known. The San Pedro Sun takes this opportunity to offer special thanks to the community of Ambergris Caye, members of the San Pedro Lions, the Business Community and everyone that worked in the effort to collect the funds needed for the repairs. While the funds raised will not be used for its intended purpose, it remains a symbol of dedication of residents to work together for the betterment of the island.